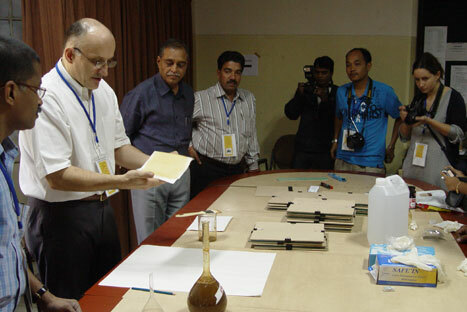 The second SOIMA (Sound and Image Collections Conservation) Programme course under an ICCROM initiative was organized in India, 16 November - 11 December, 2009, with generous support of the Ministry of Culture, Government of India and in a partnership with NRLC (National Research Laboratory for Conservation of Cultural Property). A number of reputable cultural heritage and educational institutions have contributed to the development of the course. Initiated in 2006, the programme has identified three priority areas of activity: Training, Awareness generation/dissemination, and Research. Activities to date have helped in developing effective partnerships between ICCROM and several key institutions specializing in sound and image preservation. SOIMA 2009 was also attended by BAAC member Juozas Markauskas from Lithuania, together with 22 participants representing a variety of museums, archives, libraries and other cultural institutions from India, Malaysia, Sri Lanka, Mauritius, China, Pakistan, Malawi, Kenya, Ghana, Kuwait, Italy, Belize, Guatemala, Barbados. At the end of the first training week, a mini seminar on sound and image collections, "Current Challenges and Strategies for their Conservation and Long Term Use", was organized in New Delhi. Using specific examples from their own institutional contexts, participants illustrated the current challenges confronting the preservation and access of such records in their collections and highlighted the strategies that have been planned or implemented by their institution to cope with these challenges. The presentation of BAAC’s brief history and activities was warmly welcomed as an important and not very common initiative. The model of BAAC ("audiovisual" NGO) can be used as an example while creating similar organizations in Africa and South America. 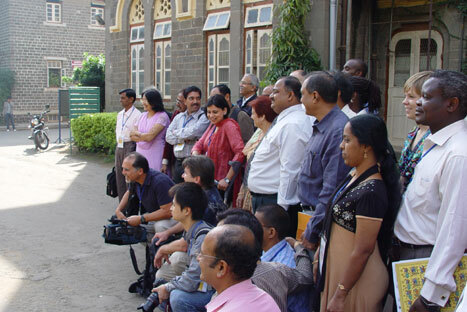 During the 4 weeks of the course, participants were introduced to topics covering concepts of significance and use of sound and moving image collections in various institutional contexts such as copyright issues, preservation and restoration of photographs, films, sound and video recordings, digital preservation and managing, best practices of cataloguing and documenting, risk assessment of collections, emergency preparedness and much more. The training team consisted of professionals brought together from around the world: Howard Besser, Kevin Bradley, Shubha Chaudhury, Girikumar, Bertrand Lavedrine, Mick Newnham, Aparna Tandon, Kara Van Malssen, Umashankar. The programme included not only lectures and discussions, held at a number of institutions, but also a lot of practical training and group exercises, where it was possible to better understand and improve newly acquired knowledge. One of the most interesting exercises was photography practice at Fergusson College (Pune). Participants tried different methods of photography techniques such as creating the Cyanotype and Vandyke photographic processes. Collection salvation workshop, after a disaster simulation at the National Museum Institute (New Delhi), demanded fast and well coordinated action by all the group. And of course, probably the most memorable episode was "field" audio and video recording (training) of a real Rajasthan desert musicians’ live performance on the roof terrace of the American Institute of Indian Studies (Gurgaon). Professional training and visits were also organized at the Alkazi Photo Gallery (New Delhi), National Film Archive (Pune) and Sangeet Natak Academy (New Delhi). This course brought an excellent opportunity to learn new topics related to safeguarding the endangered audiovisual collections; to structure and prioritize already accumulated knowledge and experience; to establish institutional and individual links and one more time to realize that we are not alone in this field. It is expected that BAAC and ICCROM will cooperate in the future, with the aim to provide necessary training for professionals working in the Baltic region.